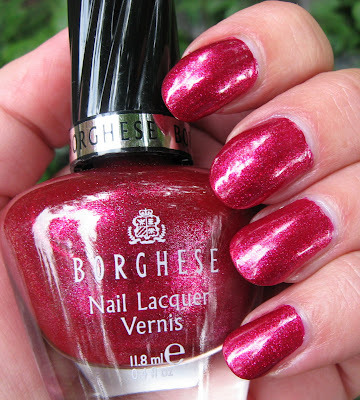 Above & Below: Borghese Festivo Fuchsia is filled with tiny silver and fuchsia glass flecks. Photographed outdoors, no flash, heavy cloud cover. Below: Bottle close-up shows the density of the shimmer. It actually has silver veining also, but unfortunately, I couldn't get that to photograph. Recently I spotted a new collection of Borghese polishes at Rite Aid, and I believe it was called Festiva. I wanted to take a picture of the display, but there were several people in the aisle with me and not wanting to draw strange glances, I decided against it. The name of the polish I picked up is Festivo Fuchsia, so it got me wondering if the name of the collection was indeed Festiva and not Festivo, but I'm quite certain it was Festiva. The collection has 6 shades, 3 shimmers and 3 cremes. 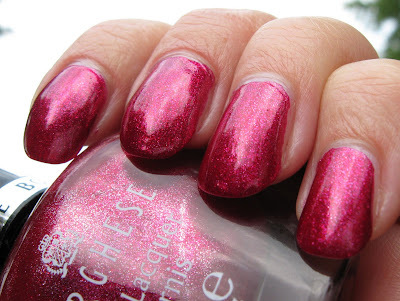 The cremes didn't look like anything out of the ordinary, but the shimmers (there's also a gold and a silver) all had tiny glass-flecked shimmer pieces, which is why I chose Festivo Fuchsia. I've always been drawn to glass-flecked polishes and this one has tiny flecks in both silver and fuchsia. It is a pink toned shade of red, although not as bright of a pink that I picture when I think of a fuchsia. The application was nearly opaque at 1 coat, but I did use 2 coats in these pictures. 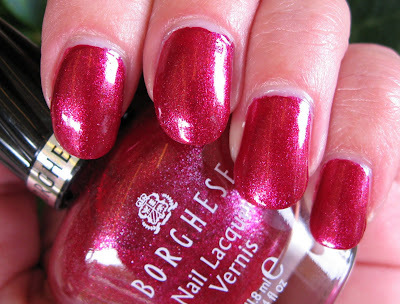 Borghese polishes have a double brush and a very short rectangular stem. Although it takes a little getting used to, it's actually a superb design. It's designed to cover the entire nail in one pass, and it comes close to achieving that. They also contain protein, Vitamin E and Olive Oil for the health of your nail and are Big-3 Free. These are priced at $8.00, which in my opinion is a little on the high side, considering the bottles are 0.4 oz. as opposed to the standard 0.5 oz. Their nail care line has been in existence a relatively short time (March 2008, I believe), but they usually offer a unique color or two in each collection. They are a better than average quality as far as the application and formula go, so I'll continue adding to my Borghese collection whenever I see one that seems different with regard to the shade or the finish. This is such a nice color! Your nails look fabulous with it!!! That's such a beautiful shade! Ever since we've moved out of town. I don't seem to stop by my drugstores often. Lol...I don't know if that's a good thing or not. I like the new lay out on the blog too. Looks great! It's such a pretty color! I think you made a good choice. 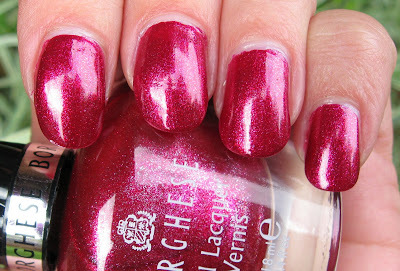 I've never been very drawn to these polishes, but I would definitely purchase this one shade for sure. The price does seem a tad steep though. Good thing it's got those good for your nails ingredients in them, that might convince me to try a couple. That colour looks gorgeous on you! 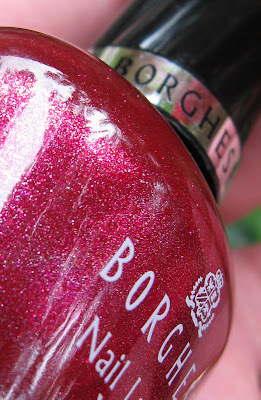 I always pass over Borghese polishes when I'm in the store,but I might try this one. How pretty your nails look! Love the shade and the glass flecks. I remember when Borghese was in department stores. They were high end like Chanel. I know I could never afford anything from their line. I guess they are high end at the drugstore now. Wow! Loving that colour. Look at that shimmer. Perfect for the A/W season too. AllYouDesire~I saw the silver in there and I had to but it! Velvet~it's probably a good thing! Glad you like the design. Nicole~they're a very good polish, but like you, I don't get that many of them for some reason. But this one did catch my eye. Pinkginger~I actually liked the silver one a lot also, as it looked like it would have a unique finish. Lucy~they have a skin care line too that's supposed to be good, although I don't know much about it, but have seen it in dept. stores. Eliza~welcome! Thank you, it really is a nice color. Loved it in the bottle, but it looks great on too!